A close head injury involves trauma or damage to the brain. Typically, a closed head injury involves bruising of the brain when, due to a sudden violent motion, it is compressed against the skull. Depending on the severity of the injury involved, neurological trauma or damage can range from mild symptoms of temporary dizziness and confusion to long-term cognitive impairment and memory loss. Since the scope and severity of a closed head wound is not always obvious at first, it’s important to consult experienced medical doctors and an attorney before accepting a settlement offer from an insurer. 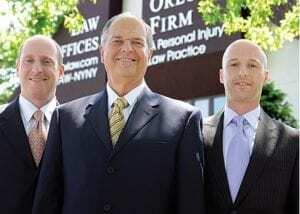 The personal injury attorneys at The Orlow Firm recover damages for victims of closed head injuries. We regularly consult with medical experts, psychologists, and neurologists in determining the scope and extent of our client’s injuries. In closed head injuries, the degree of recovery depends on a number of factors. If you’ve suffered a closed head injury, contact NYC personal injury law office of The Orlow Firm today to schedule a free consultation to discuss your case. Insurance companies are interested in paying as little as they possibly can in accident claims. As a result, it’s not uncommon for insurers to use their own investigators to try and determine if you were in any way at fault for an accident. Since New York is a pure comparative negligence law state, any compensation an injured person is eligible to receive can be reduced by the percentage amount of their fault. For example, if your losses equal $50,000 but the court determines you were 50% at fault, you are only eligible to receive $25,000 from the insurer. That’s why our lawyers work with accident investigators in order to reconstruct what happened and challenge attempts on the part of insurers to place more blame on our client. The long-term consequences of a close head injury can be significant. Before speaking to an insurance claims adjuster about your case, contact the experienced New York City closed head injury attorneys at The Orlow Firm today to schedule a free consultation and discuss your case.